« Was Ambassador Stevens responsible for the weapon that killed him? The scare words “fiscal cliff” entered the political game in February when bearded professor, Ben Bernanke, warned Congress about the austerity measures set to kick in automatically at year’s end. A warning to democrats? 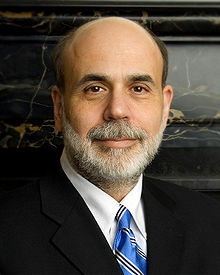 Yes, remember that Ben Shalom Bernanke was appointed by President Bush way back on February 1, 2006, to be chairman of the United States Federal Reserve. Now Bernanke is doing his best to repay Bush by forcing Congress to keep the Bush tax cuts for the rich. A New York Times article claimed the full Bush-era tax cuts were the single biggest contributor to the deficit over the past decade, reducing revenues by about $1.8 trillion between 2002 and 2009. As part of the “fiscal cliff” package, the Bush tax cuts for the rich are due to expire on January 1, 2013. These tax cuts are for incomes of $250,000 per year, and above (plus $4 trillion+ for the Bush wars). Joining Bernanke in misleading the American people is House Speaker John Boehner, who claims that the Bush tax cuts will hurt small businesses, those who account for most of the jobs in the U.S. What Boehner fails to point out is that 94% of small businesses fall under the $250,000 figure—while only 6% are above that amount. Bernanke’s scare tactics and Boehner’s lies are the last ditch stand of the Republican Party to serve the rich at the expense of the middle class. The so-called “fiscal cliff” will do away with the Bush tax cuts, as well as lowering defense spending with minor impact on the growing American economy. The “fiscal cliff” will not hurt the economy; it is a good thing—except for the Rich.